Activated nuts. Good or bad? When celebrity chef Peter Evans said he snacks on ‘activated almonds’, even health professionals looked bewildered. So, exactly what are activated nuts? An activated nut or seed has simply been soaked in water for 24 hours, then dried out again over a low heat .Raw nuts contain phytic acid and enzyme inhibitors that can reduce the body’s ability to absorb certain nutrients properly. Eating large amounts of raw nuts can put extra pressure on your digestive system and may cause uncomfortable digestive symptoms like bloating, heaviness and nausea. There are numerous studies in grains and legumes that show soaking and/or germination decreases the amount of phytate in the seed, and the amount of easily absorbed minerals increases. Unfortunately, there is no scientific evidence to judge what changes occur in soaked nuts or how long you need to soak them for these changes to occur; and most importantly, whether any changes that do occur make a nutritional difference to the person eating them. Irrespective, nuts – soaked or not – are a fantastic healthy snack, loaded with protein, healthy fats, fibre and important minerals like zinc, magnesium and calcium. A handful a day can help control high-cholesterol and blood glucose, and reduce the risk of heart disease and diabetes, as well as help to manage weight and appetite. So whether you like your nuts activated or raw, they are still a great addition to any health diet! Almonds: Almonds boast one of the highest fibre counts of all nuts which can help lower cholesterol and make you feel full. Adequate fiber also lowers the risk of diabetes and heart disease. Cashews: Along with their healthy fats, fiber, and protein, cashews are a good source of iron and are particularly rich in zinc. Pecans: Pecans aren’t just for making tasty pies, they can also help improve heart health. Brazil Nuts: Just one Brazil nut packs more than 100 percent of the recommended daily allowance for the mineral selenium, which the body uses for reproductive processes, to help metabolize thyroid hormones, and to help prevent cell damage that may lead to liver, prostate, colorectal, and lung cancers. Macadamias: Although they’re one of the most calorie-dense nuts, macadamia nuts contain one of the highest counts of heart-healthy monounsaturated fat per serving. Pistachios: Pistachios have just four calories each, and if you buy them in the shell, they’re especially diet-friendly, as the shells automatically slow down your pace so the snack lasts longer and you eat less overall. Hazelnuts: An all-around healthy nut, hazelnuts are notable for their high levels of monounsaturated fats, which can improve cardiovascular health and help to manage type 2 diabetes. They’re also rich in several antioxidants that can help protect against chronic diseases, including heart disease, and inflammatory diseases. 1. Soak the almonds in the water for 12 hrs. If you’re using other hard nuts (like hazelnuts or brazil nuts) 12 hrs will also work. If you’re using soft nuts, like cashews or pistachios – shorten soaking to 4-6 hrs. NOTE: After soaking, the nuts will look nice and puffy and may even start to show signs of sprouting. 2. Rinse the nuts under running water, and if you want to add flavour – now is the time to do it. Just shake a couple of tsp of whichever flavour you want over the wet (rinsed) almonds, and stir to combine well. 3. Now, it is time to roast the almonds, without damaging all those nutrients we’ve activated. Dry out the nuts on low heat – either in a dehydrator or in the oven on a low temperature (60C). This will take anywhere from 6-24 hours, depending on the temperature. The nuts will be done when they feel (and taste) dry. 4. 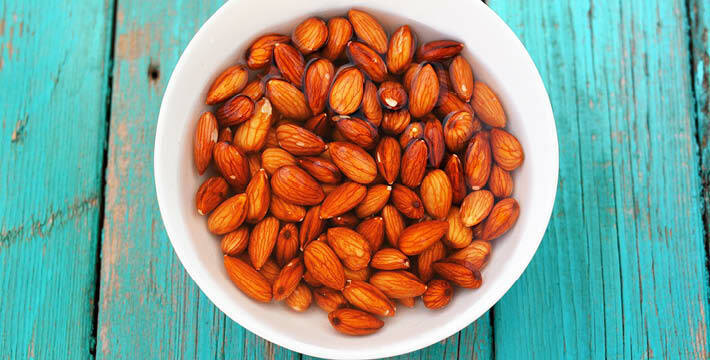 Use your activated-dried almonds as you normally would use roasted almonds. They last really well in an airtight container and they can be ground into almond meal, too!